Finally the time has arrived to move on to the next level of Development. Get ready with your MAC OS X and warm up your hands for the upcoming tool called iOSOpenDev. 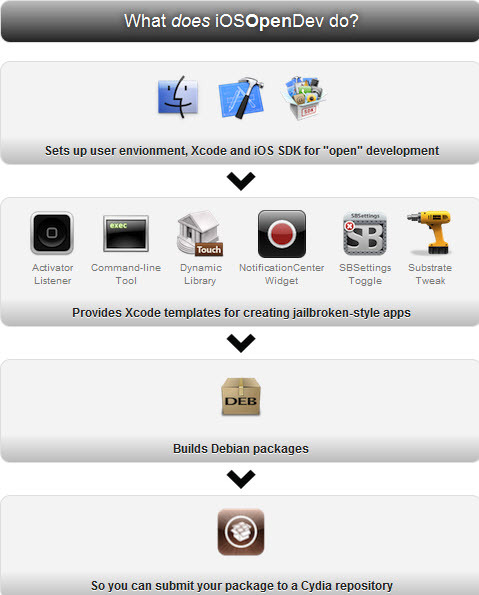 iOSOpenDev will be a simple tool which will let you develop Apps for the Jailbreak community using Xcode. A developer named Spencer James is nearing release of his project iOSOpenDev, which “sets up user environment, Xcode, and iOS SDK for ‘open’ development.” The project will come with Xcode templates for creating common types of jailbreak tweaks, including Activator listeners, command line tools, dynamic libraries, Notification Center widgets, SBSettings toggles, and Mobile Substrate tweaks. It will even build .deb files of the completed projects for when a developer wants to submit to Cydia for publication (although community repo managers all pull a part .deb’s for security anyway, to understand the packages contents before publication). Many of the hackers and Developers of the Jailbreak community don’t use Xcode to create Tweaks for Cydia. They do all the procedure manually. This iOSOpenDev will allow those people and those who are developing Apps for Apple using Xcode to make some cool Tweaks for the Jailbreak community by iOSOpenDev. This is a really great opportunity for those who are in development, know a little about development, or are willing to learn about development of Cydia packages (.deb files). The Developer of iOSOpenDev has demoed his awesome piece of work which gives a little idea about his work. Till now there is no specific ETA for this Tool, the developer has said to release the tool when he is finished with all testing on different MAC OS X’s. The ETA told by the Developer is about a week or so. Once the tool is ready, it will be made public. No words have been said on the pricing of this tool. We hope that the tool debuts soon, so we can see many more Tweaks and improvements to the current Tweaks like SBSettings.